Heathcote & Ivory has introduced a range of alcohol-free perfume gels in rollerball applicators. Each scented formula 10ml (£4) is enriched with shea butter and vitamin E for soft, scented skin and the company suggests they will make ideal stocking fillers. 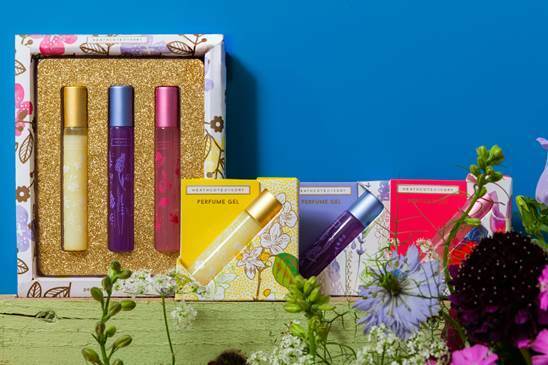 The collection includes Lavender Fields, a modern lavender fragrance with hints of powdery, almond and musk notes; Neroli & Lime Leaves, described as 'the gift of sunshine in a bottle' with hints of jasmine, precious woods, sweet amber, musk and memories; and Sweet Pea & Honeysuckle, a blend that also includes notes of jasmine, gardenia flowers and hints of musk. There is also a Perfume Gel Collection set, £10 (3 x 10ml) which contains all three scents. They are on counter this month.